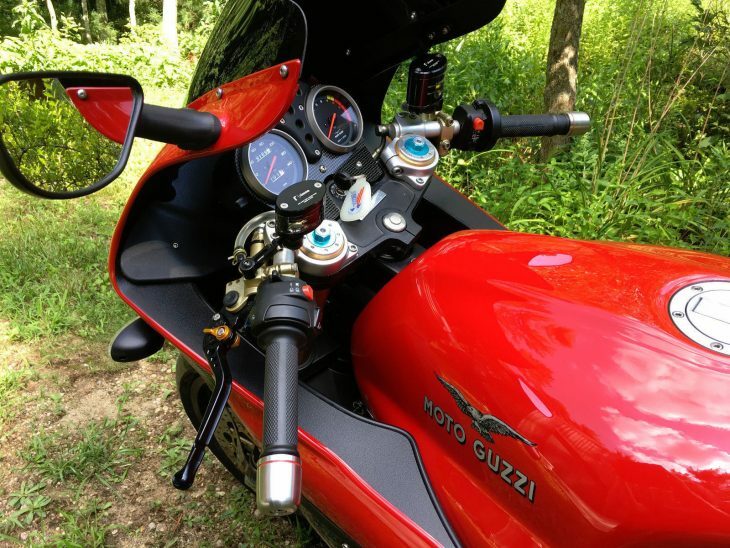 While there are certainly other, more exotic and rare Moto Guzzis to consider, the 1100 Sport is a fine choice for those interested in Italian ownership without pandering to the chores of hyper-rare, unobtainium parts, and temperamental Italian thoroughbred ownership. 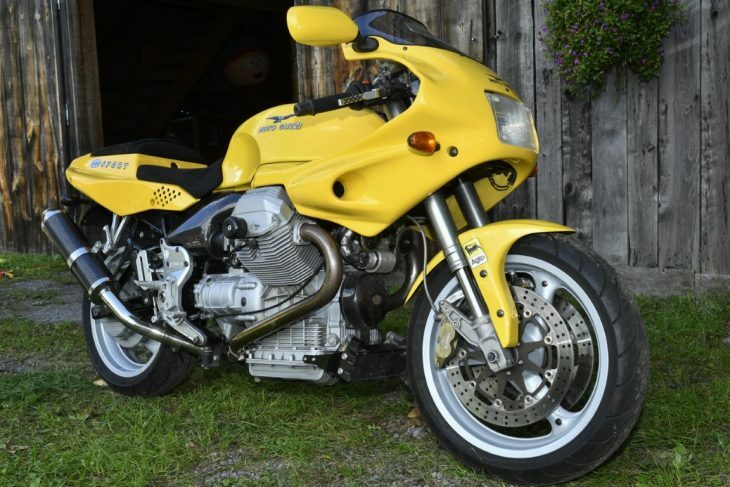 With the 1100 Sport you get all the basics you would expect in a Guzzi - transverse 90 degree V-twin with air cooling, a sporty silhouette and shaft drive - packaged in a bike that you can ride. The longevity of these machines is legendary. 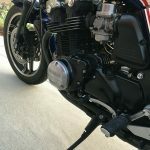 What you don't get is all of the headaches associated with the Corse models, nor the added complexity and maintenance of the "upper scale" versions with higher horsepower ratings, 4-valve heads, etc. 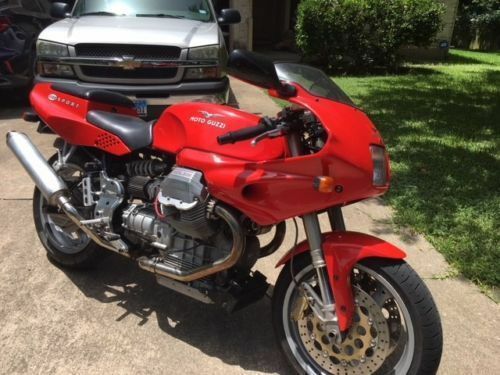 But fear not, even a pedestrian model Guzzi will turn heads, and give forth smiles and miles aplenty. 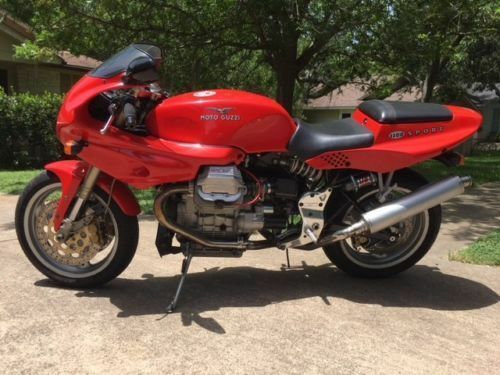 If you are familiar with Moto Guzzi history, you could consider the 1100 Sport model as a successor to the legendary LeMans series - although in reality it never really captured hearts and wallets in the same fashion. 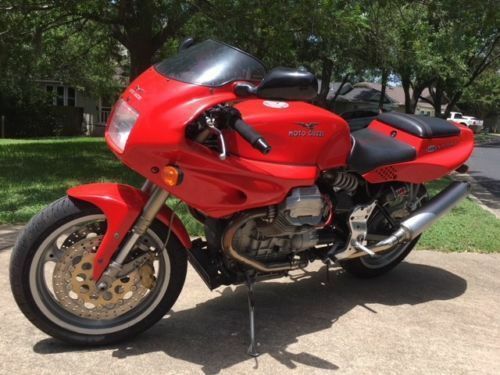 It is what one might consider a bargain Daytona of the brand, or possibly even an alternate take on a 90s era Ducati 900 Super Sport. 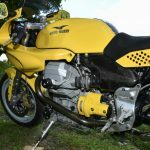 Riders of Japaneses hyperbikes deride the Guzzi for its loping, slow delivery of power. 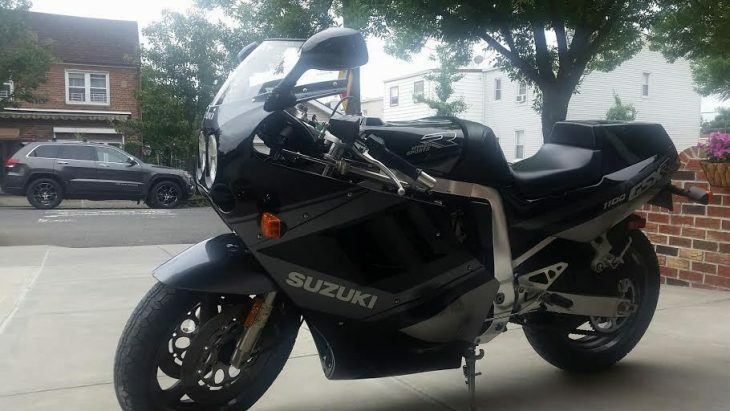 They point out it is heavy, and that no real sport bike ever used anything but a drive chain. But the 1100 Sport was not made for the cut and thrust of the race track. 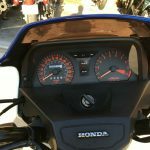 It is a real world rider, with 90 horsepower all coming in below 8,000 RPM. 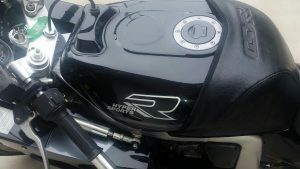 At about 480 pounds this is no featherweight, and its forte is much more the sweeping corners of a canyon than late braking into hairpins (although the triple Brembos are up to the task). 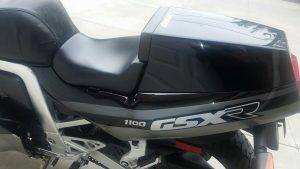 It is reasonably comfortable with good ergonomics and adequate wind protection from the sport-styled fairing. 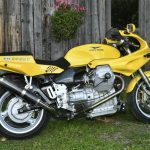 It is a motorcycle with which one can do motorcycling things, and it does none of them so well as to make it stand out. 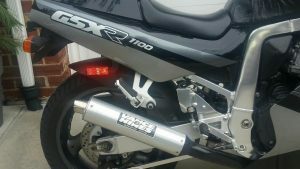 If it seems that I am damning the 1100 Sport with no praise whatsoever, fear not. 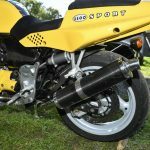 The 1100 Sport is a truly capable motorcycle. It is not available in copious numbers in the US like your average NinjaBusaBlade. 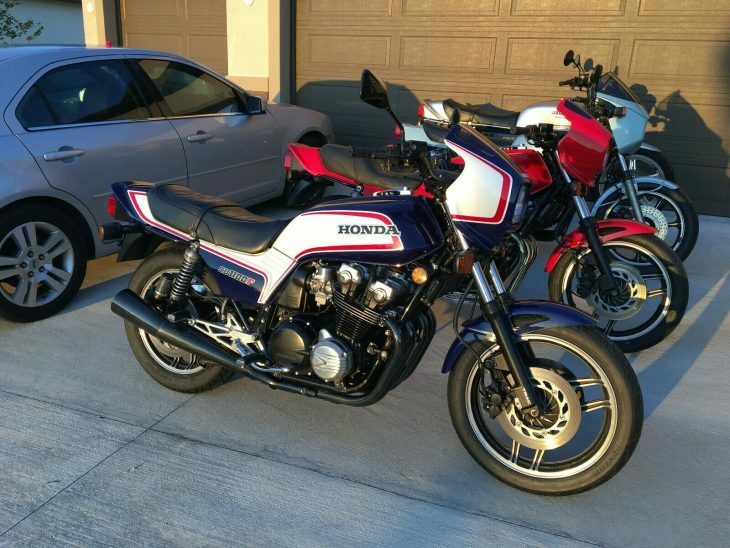 It is not ultra rare like an NR750. 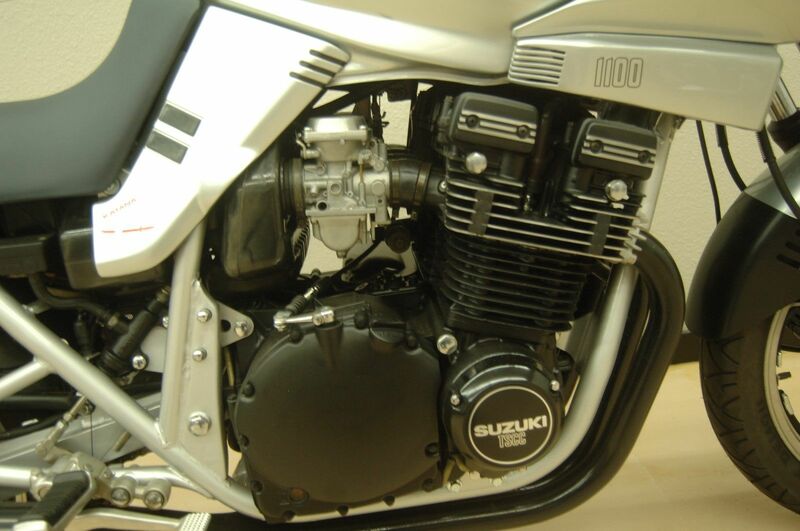 It is not lusted after like a RC30 or OW01. 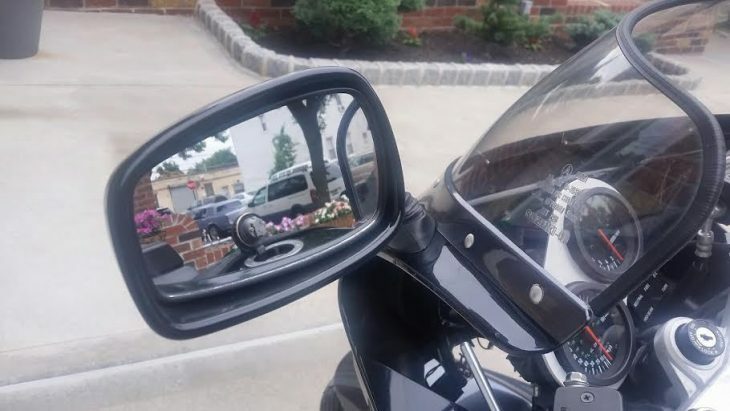 This is a motorcycle to own and enjoy because you like to ride. It will never be a collector, but that is not a bad thing. 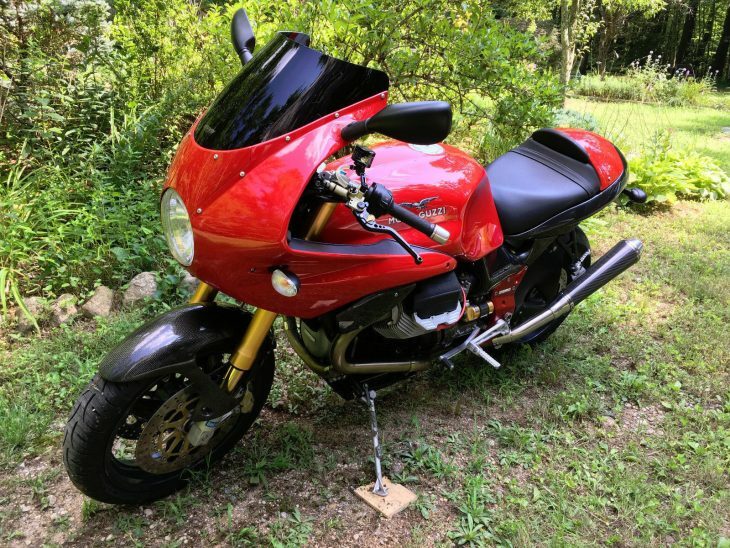 In many ways, this 1100 Sport is everything a motorcycle *should* be, without a lot of the flash and drama to confuse the experience. 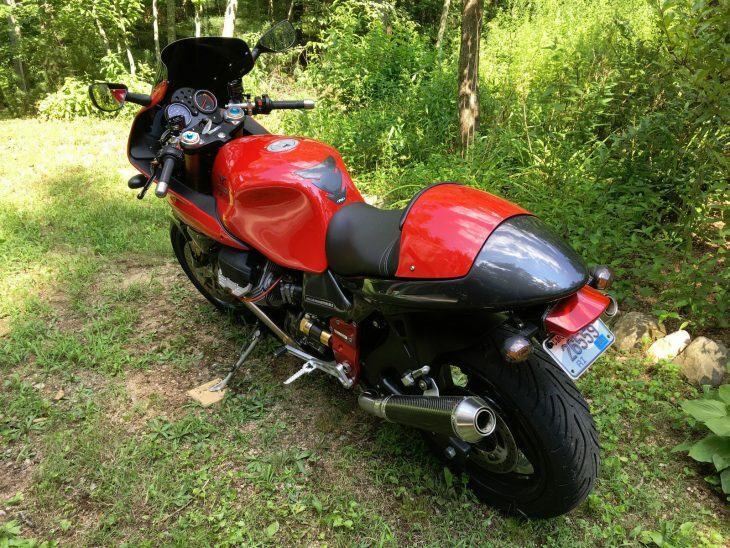 Reliability is good, maintenance is relatively easy (no belts to change, fewer valves to adjust, shaft drive, fuel injection, etc), and yet you still get the exotic aura of an Italian machine. Check it out here, and let us know what you think. 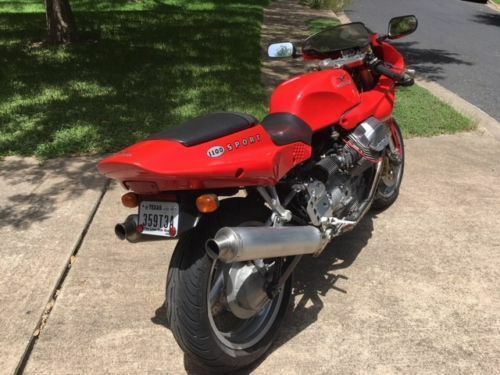 The pics are a bit low res, but the bike really stands out in "arrest me" red. 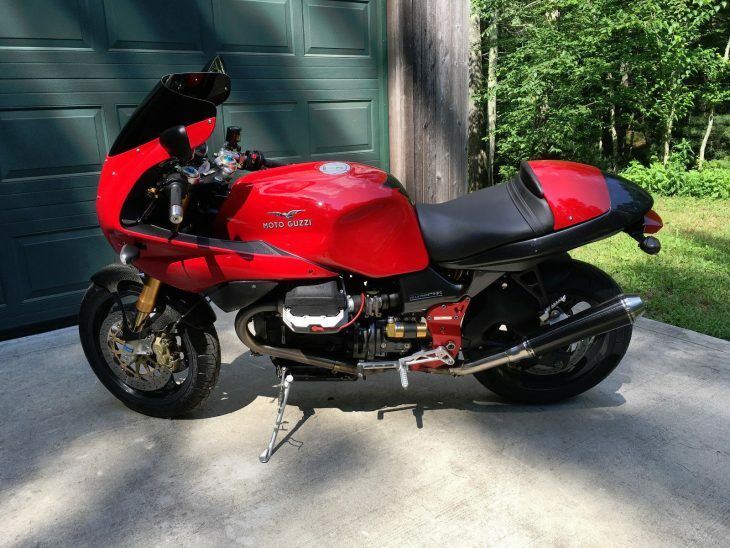 The miles are more than one might expect from a sport bike, but (with proper maintenance) that is right up Guzzi territory; like their BMW counterparts, these bikes are meant to eat up miles. The asking price might be a bit on the upper scale of the range, but the seller is open to offers. This could be a fine rider - and a bargain in the making. Good Luck! It came from the 80s. And while that is an accurate tag line, the truth is it sort of oozed its way boldly out of the 1970s. 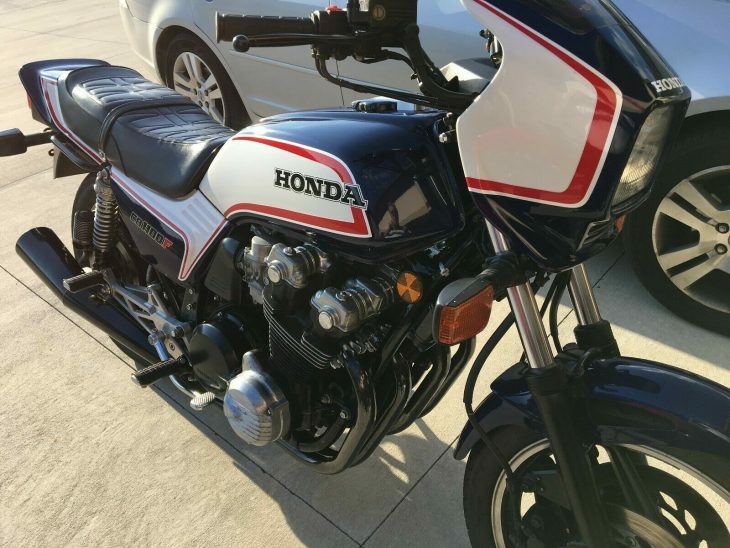 Like the last of the front-engine Formula 1 racers, the Katana was visually stunning and stood at the pinnacle of old-school performance. 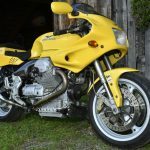 Unfortunately, that pinnacle was really a precipice; the new world of liquid cooling, single shock swing arms, GP-inspired 16-inch front wheels, five valves per cylinder and aluminum perimeter chassis was just around the corner. 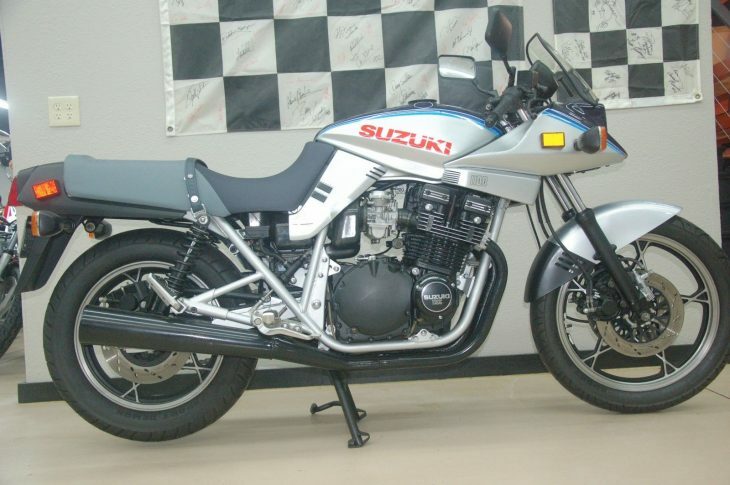 By 1984 the Kawasaki Ninja made the Katana a hot-rod relic, and the remainder of the Big Four were close behind. 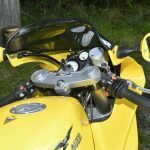 Suzuki gamely fought back with the likes of the Gen I GSX-R, but the era of air-cooling was headed the way of the dinosaur. 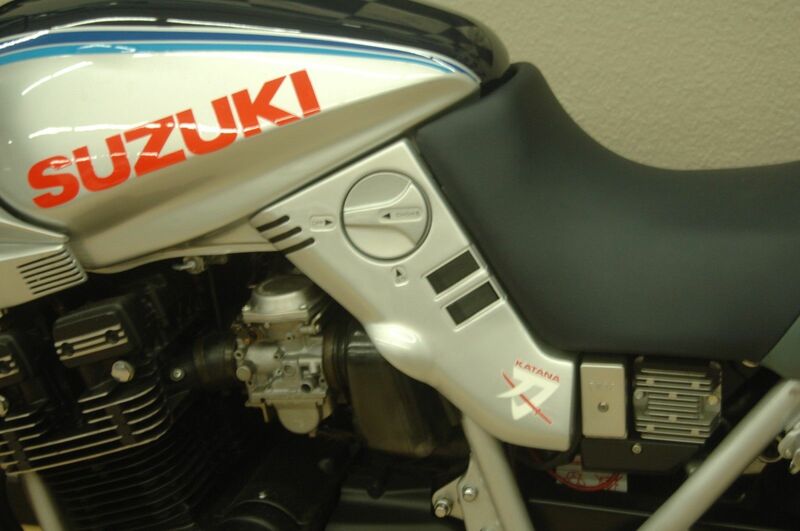 Yet for a brief period of time the Suzuki Katana was top dog - and remains an iconic model even today. 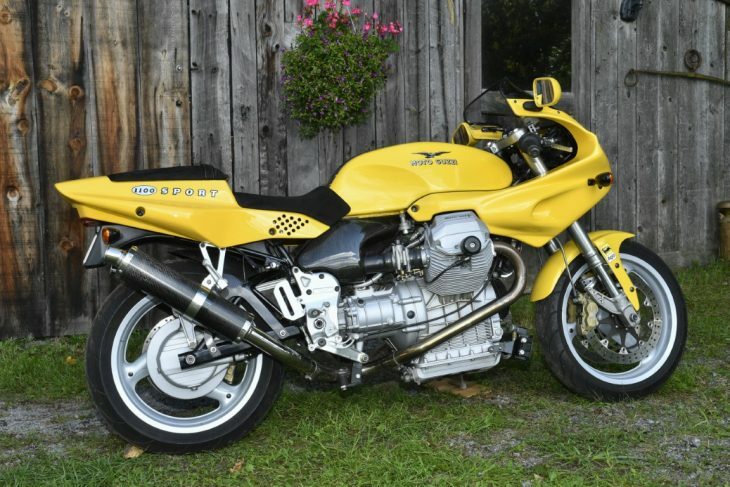 The seller has provided an accurate account of how the design of the Katana came to be, but fails to note the pedigree of Muth (long time BMW designer responsible for the R90S, R100S, R100RS and R65LS to name a few), and the extent to which the Katana design language extended throughout the Suzuki model range. 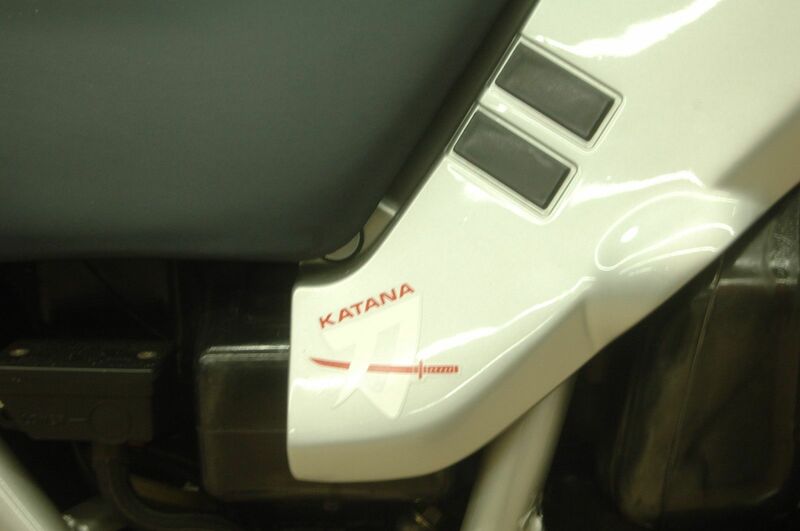 The Katana was the most visually extreme, but the XN85 Turbo and full range of GS models all retained key elements and lines of the Katana. But the Katana wasn't just another pretty face. 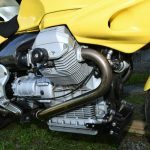 Stuffed full of a DOHC, 1100cc in-line monster of a motor, the Katana was claimed to be the fastest mass-production motorcycle of the day with 80+ HP (!). 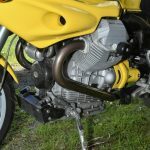 Beneath the styling, the rest of the bike was surprisingly pedestrian; a stock GS1000 chassis complete with twin shocks. Wheels are 19 inchers, likely chosen as much for style as performance. Ancillary components hang off the end of the crank, making this bike impossibly wide. 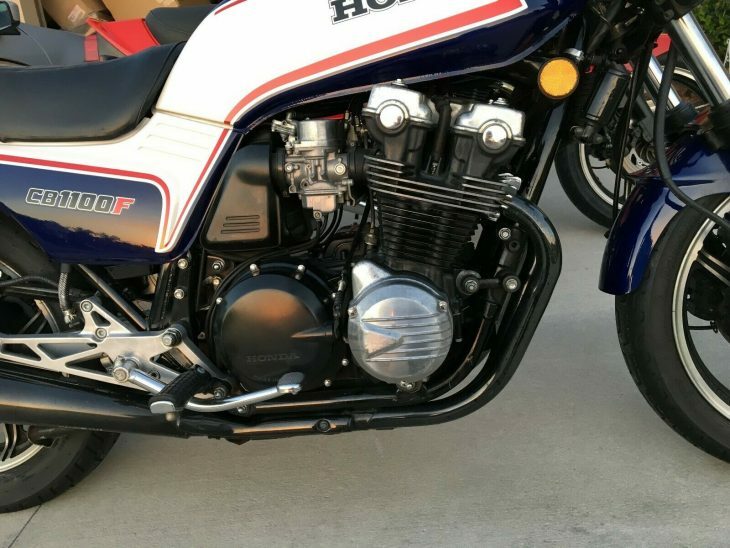 While some technology peeked its way into the build (4-valve heads, anti-dive fork), the Katana was really a tarted up, big motor bike. Which is why we love it. 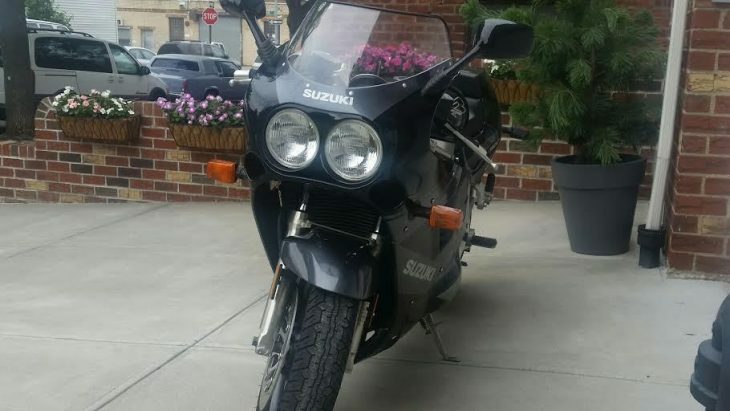 You are looking at a great condition 1983 Suzuki GS1100S Katana, one of the iconic bikes of the early 1980s. 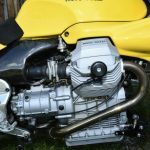 The 1100cc model of 1983 replaced the 1982 1000cc model which was supposed to be part of a homologation program to make them eligible for Superbike racing. 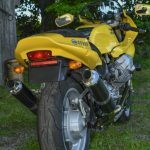 The Katana project actually began in Germany with a company called Target Design in 1979 with Target Design to improve Suzuki’s GS1100. 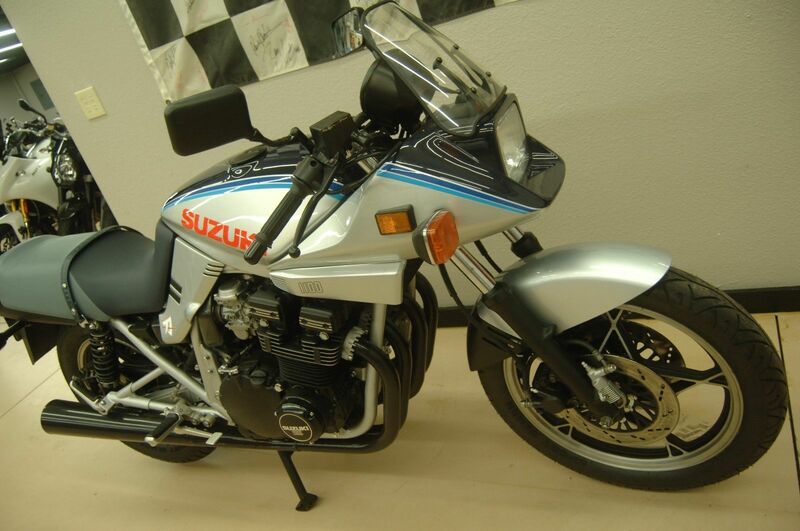 Ex-BMW designers Hans-Georg Kasten and Hans Muth partnered with Brit Jan Fellstrom to overhaul the Suzuki lineup. 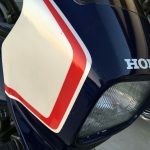 The Katana, named for the famous Japanese sword, first appeared at the Intermot show in Cologne in May 1980, and production examples appeared a year later with only a few changes from the show bike. 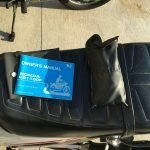 It will require some attention to make it roadworthy if it is supposed to be ridden. 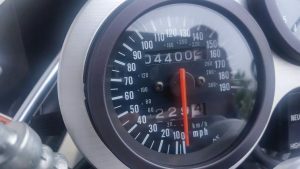 Please note that the title will show an odometer discrepancy according to the BMW regulations in Ohio. 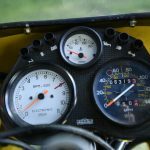 The mileage shown on the speedometer on the bike is 75, but the actual mileage is approx. 6060. 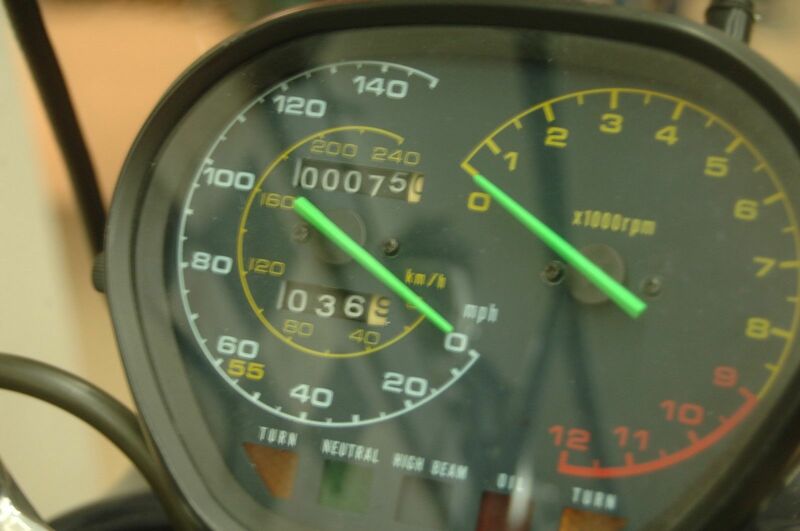 The original speedometer showing 5984 miles will be included. Complete and original (or period correct) Katanas are getting stronger on the money side. 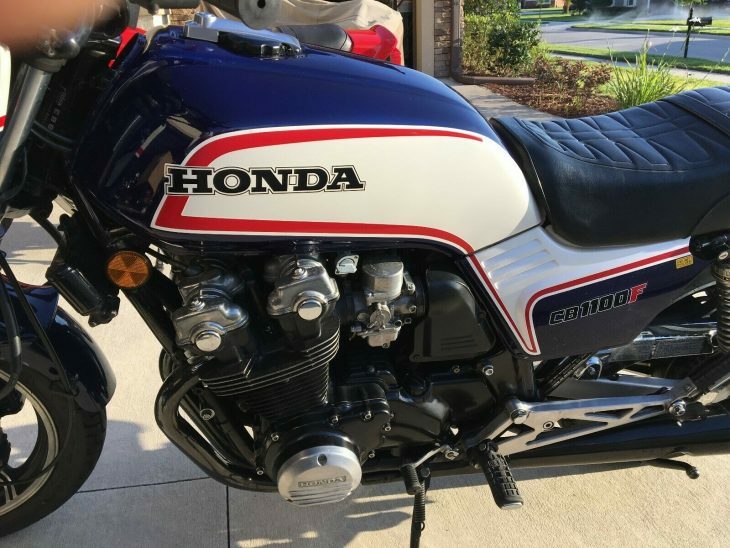 While time has tamed their brutal status as a monster - performance slower than that of a middleweight today - keep in mind that the chassis and suspension is pretty much 40 year old technology. While never a canyon carver in its day, Katanas today are best utilized for more genteel rides and for the show. 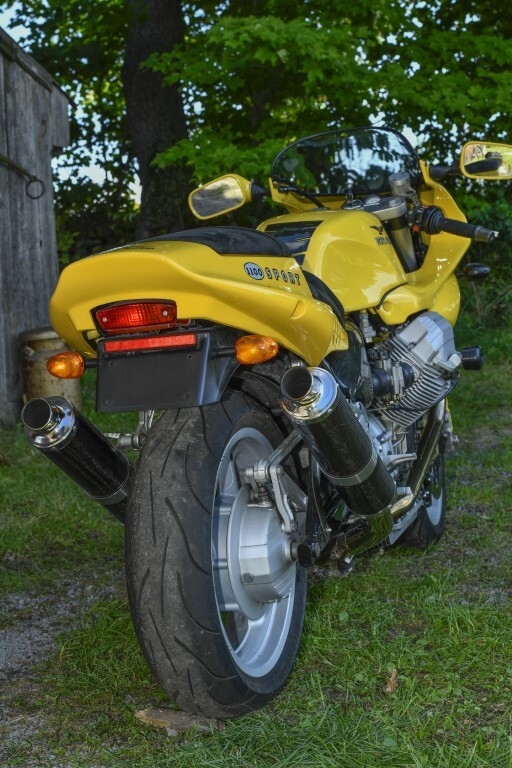 Today's bike is more on the show side of the fence, having traveled only 6,000 miles in its life and being the resident of a private collection. 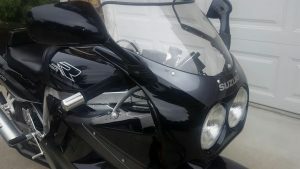 The seller notes that due to the time it has sat it will need to be serviced. That likely means carbs and tires, and any other pieces that have gone brittle with age. 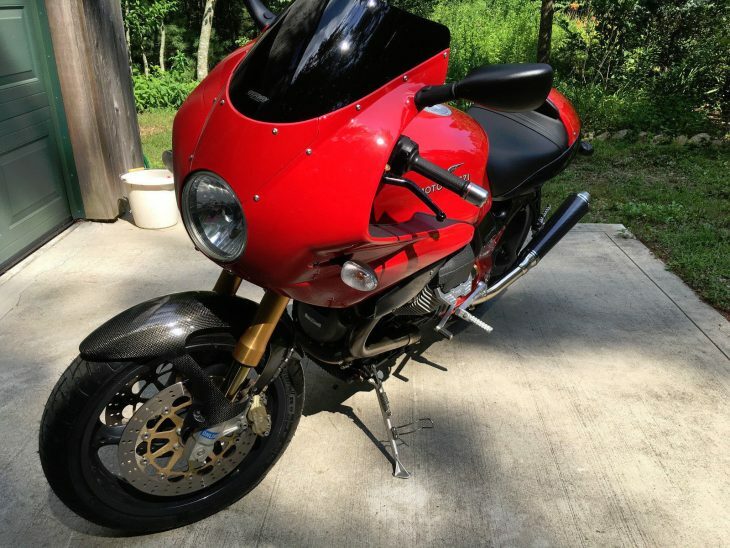 This bike is currently at $4,500 with several days to go - and what appears to be NO Reserve. The current price is a bargain for a vintage Katana, although with over 100 watchers it will surely climb before auction end. We don't see a lot of these, but looking at past pricing puts an average somewhere in the $8k arena. 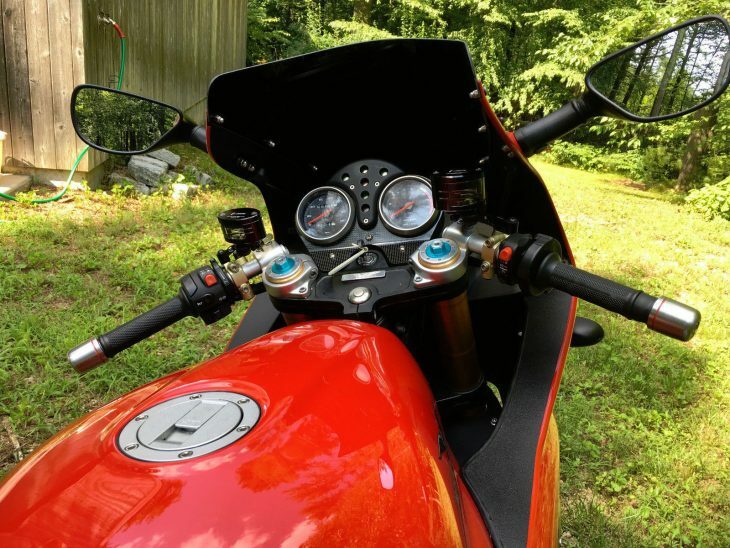 This bike appears cleaner than most, which may help elevate its value. Check it out here, and then jump back to the comments to share your thoughts. 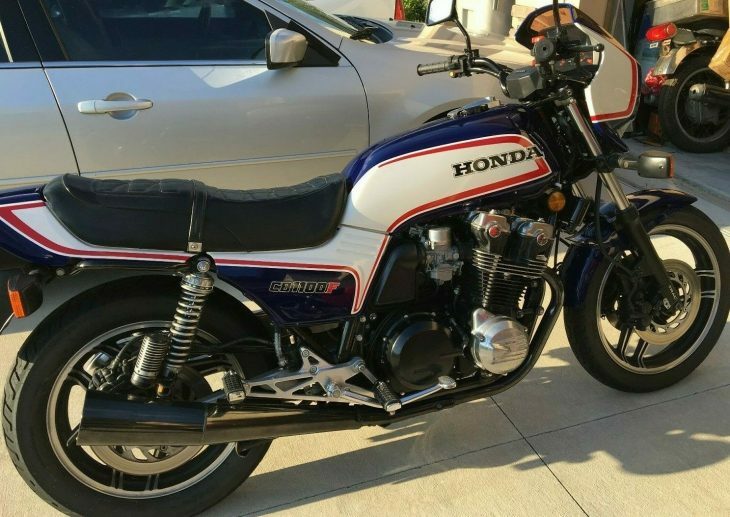 Is this a Love It or Hate It bike for you? Good luck!! 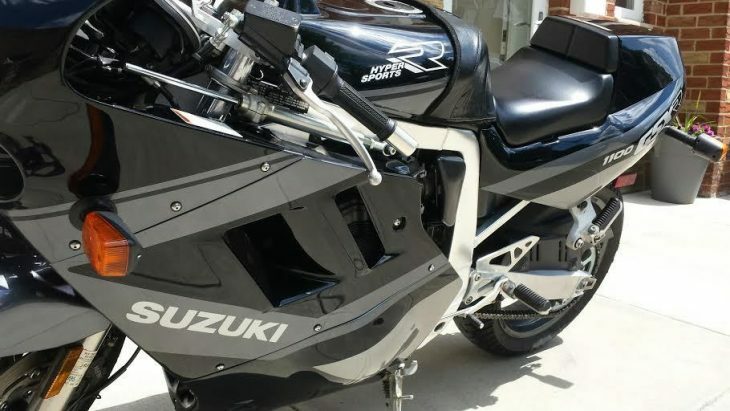 Though the reasons for hiding away a top-of-the-line sportbike may be a head-scratcher, it's a thrill to come upon the bike you lusted over back in the day - stock and barely used. 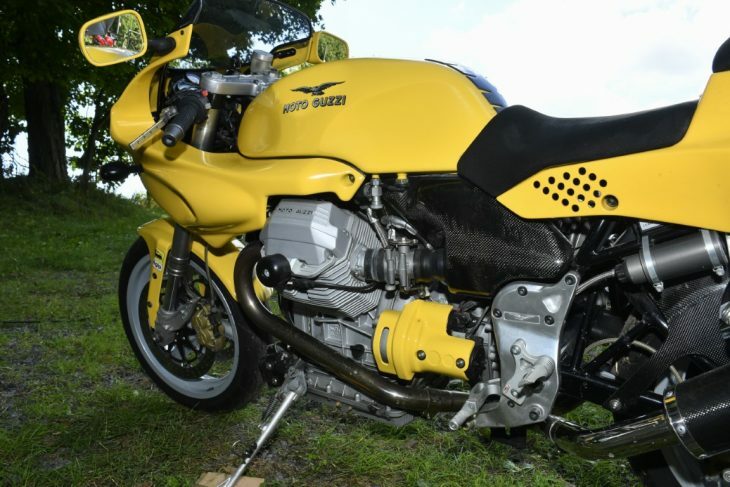 This 1127cc K-variant has just 4,400 miles, stealth paint scheme, and spent all its nights in a Queens garage. 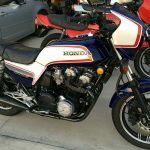 With a newly developed air-oil cooled engine shoehorned into the slightly modified frame from last year's 750 model, the GSX-R1100 was poised to be the big Kahuna in 1989. 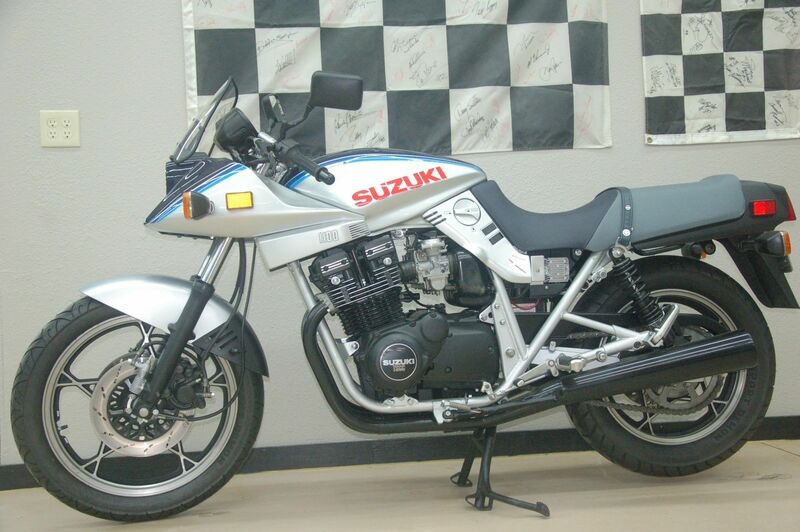 The 138 hp package had a two-stage oil pump to ensure reliability, called the Suzuki Advanced Cooling System. 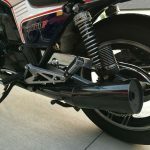 The high-hipped aluminum frame was beefed up and had 43mm Kayaba cartridge forks in front, with Full Floater monoshock rear, both fully adjustable. 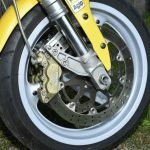 Brakes were Suzuki's own 310mm fronts with 4-piston calipers, and 240mm rear. 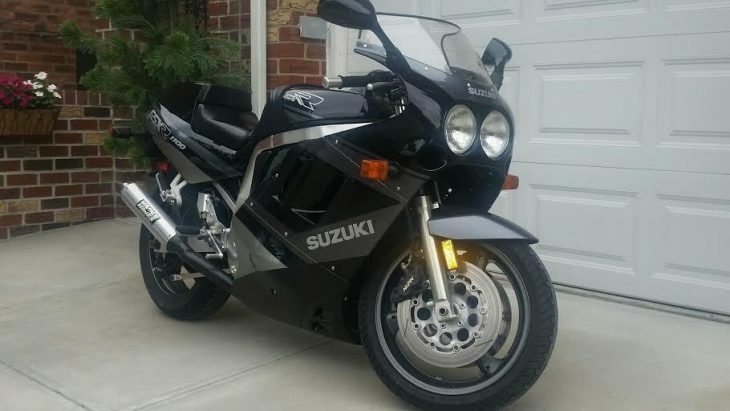 Up for your consideration is a 1989 GSXR1100. 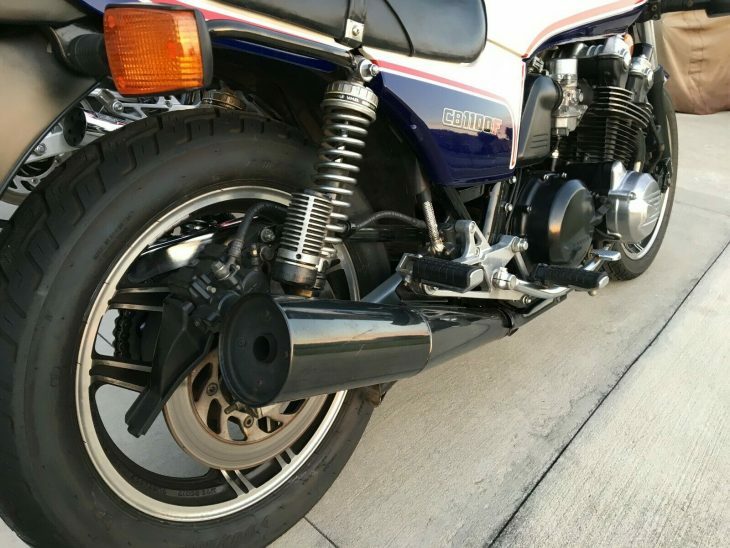 I feel the condition of this bike is way above average for the year and miles (4400 miles). The originality speaks volumes as to who owned it and how it was treated. 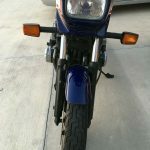 The bike was bought by me as a collector bike and never put on the street. It has been keep in my climate controlled garage for the past several years. 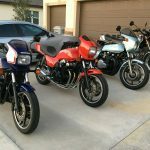 Since most of these bikes have been crashed and repainted you would be hard pressed to fine another in the condition of mine . 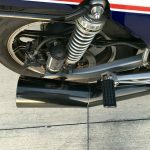 The only modification is the vance & hines exhaust which was installed at the dealer when new . 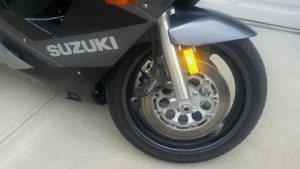 This bike still wears its original michelin tires which i have included a picture of the date code. 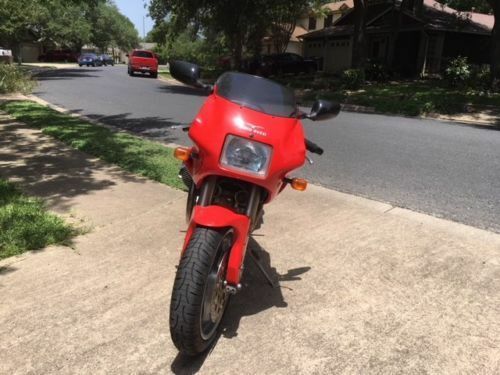 Please keep in mind that this is a 27 year old motorcycle that has been off the road since 1995 and will need normal maintenance if you have intentions of riding it. 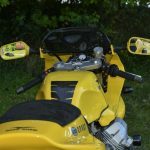 I won't say anymore about that as I will let the pictures of the bike speak for themselves. If you have any questions or would like to make a reasonable offer please email me your # and the best time to call . All sales are final , no warranty and sold as is where is.